As a voracious reader of African fiction, what worlds do you discover that may remain distant to the non-reader? In a matter of hours of reading, I am able to experience other African cultures. For example, I am able to visit Egypt through the eyes of Naguib Mahfouz, explore parts of Cameroon by reading Calixthe Beyala, appreciate South Africa and its growing pains from Nadine Gordimer’s perspective, understand Zimbabwe from Yvonne Vera’s lens, appreciate parts of pre-colonial Nigeria with Chinua Achebe, even explore aspects of my native Ghana from another angle from someone like Ayi Kwei Armah. The list goes on and on. Africa has many brilliant writers who entertain and challenge us, expose us to different parts of the continent we may not have had the chance to visit, and even offer us different perspectives on those we’ve already experienced. Because reading requires use of all the senses through the imagination and because African literature is so rich and diverse, this is highly empowering and transforming. You’ve been reviewing African novels on radio in America and providing listings of titles on the Internet for sometime now. Who is your audience and what kinds of feedback do you get? The audience comprises of those interested in African and Caribbean culture and literature, although part of what we are doing is intended to increase that interest. Given their ability to reach a wide audience, radio and the Internet are both powerful media for showcasing African works. The reviews and title listings allow us to share works that otherwise might go unnoticed. In recent months, for example, we have tried to include works published in Africa that may otherwise fall under the radar of fiction readers. This approach has especially struck home. I have been encouraged to continue to bring these works to the attention of the audience. At the same time, more and more writers and publishers are taking note of the reviews and listings and encouraging its continuation as a way to promote African works. As an African novelist, how do you feel about the low readership you and other authors like you enjoy? 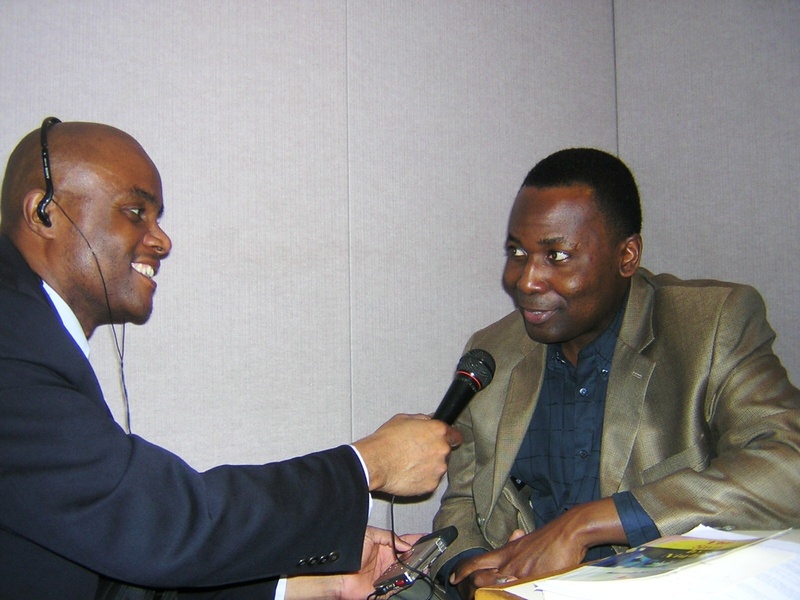 How unique is radio as a medium to introduce African literature to an American audience? Radio is able reach a much wider audience and in a quicker way than other media, whether broadcast or otherwise. It is easily accessible, easy to transport and does not necessarily require a long time commitment. It is for this reason that a program like Afriscope occupies a unique place in the media by offering an American audience the opportunity to explore Africa’s peoples, culture, history, and Africa’s vibrancy which are all embodied in one way or the other in the continent’s literature. How do you want readers of your first novel, The Clothes of Nakedness, to approach the work? I encourage readers to pay close attention to the Akan proverb from which the title is derived: “If Nakedness promises you clothes, hear his name.” In a world of clothed people, what does this nakedness mean? I also encourage readers to ask the question: Who and/or what is Mystique Mysterious? Mystique Mysterious is the character in the novel around whom all the others revolve. Seemingly full of good intentions, he promises jobs to unsuspecting poor people and exacts a price for that. We know very little about him and it is fascinating, in my view, to see how differently the other characters react to him. Do they succumb to him completely? Do they ignore his influence in the community until it is too late? Or do they deal with him squarely and face the consequences? I think these questions will facilitate a better appreciation of the novel. The Clothes of Nakedness won the 1999 Commonwealth Writers Prize for Best First Book for the African Region. It has also been adapted by the BBC for radio. How do you feel about these honors? The recognitions are very gratifying. I wrote the novel simply because I like writing. Finishing it was ample reward for me. The award and radio adaptation, therefore, have been completely unexpected. In particular, the radio adaptation was fascinating as it allowed the novel to be expressed in a different medium. I was thrilled to sit back and see another’s interpretation or, if you will, reinterpretation of the book. It appears that a growing genre of African fiction in America deals with the immigrant experience. What specific purpose does this body of work serve? It allows for Americans and others to experience America through another cultural prism. It takes such readers from the comfort of their own experiences and opens another window to them. It is harder to appreciate what the other person is saying unless you’ve lived in his or her skin. Of course, it is impossible to do so, but this genre of African fiction gets us close. If read closely and with open-mindedness, that kind of writing can even move us closer to empathy, and hardly anything is more effective than that. How do you read the prospects for greater readership for African fiction in America? Writers everywhere encounter enormous difficulties. For African writers, coming from and writing about a continent that continues to be marginalized, these difficulties are compounded by other factors. Anyone who doubts this should pick up Charles Larson’s The Ordeal of an African Writer. I have hope, however, in the fact that African writers continue to write amid overwhelming odds. And in some ways, there have been some breakthroughs. Achebe, for example, stands out. It is the resilience of the African writer that gives me hope. Unique African media like Afriscope Radio are helping to spread the word. I’d like to see similar oriented programs proliferate. What have you been working on these days? Are there any new novels in the horizon? I have been working on other fictional titles as well as a number of short stories. Things don’t always move at the pace we would prefer, but one has to allow these things to take their natural course. I am hopeful that something will come out soon, though.